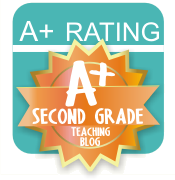 Smiling in Second Grade: What Will You Do Differently? It's that time of year when I start thinking about September. Yeah, I'm not even out of school yet. I am that girl. As I'm wrapping up the end of the school year, I am always looking forward to next year. Some people might call me crazy. Some of you just might agree with me! Kim certainly does! 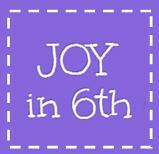 Over at Finding Joy in 6th Grade, she is hosting a linky party to share what we are thinking about for next year! 1. I hope to do more hands-on, long-term projects with my students next year. I really want to instill that love for learning. I'll have a better handle on the Common Core, so I will be able to plan these more meaningful learning experiences. 2. 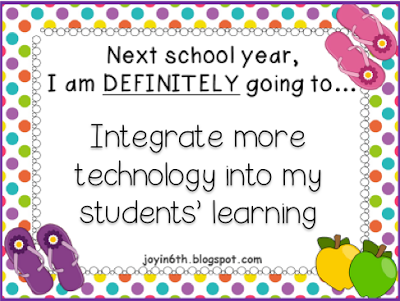 Technology has become such a large part of our students' lives and I am hoping to incorporate it into my classroom the best that I can. This also relates to my first goal. I would love to have my students use technology to really take control of their learning in creating projects. Okay, that's all I've got so far. Nothing is definite for next year, which makes it difficult to plan and prepare. I'll get there though! What are you definitely going to do next year?? Go link up with Kim! I also am thinking about next year, even though I'm still in school! I've been keeping a journal of ideas for next year, so I don't think you're crazy at all!! I also need to incorporate more technology next year in my lessons! I get tired of my students not knowing how to search and find appropriate information on the computers!